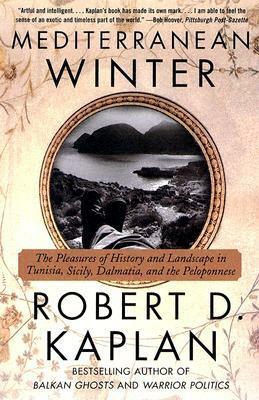 Blurb from Goodreads: In Mediterranean Winter: The Pleasures of History & Landscape in Tunisia, Sicily, Dalmatia & the Peloponnese, Robert D. Kaplan, the bestselling author of Balkan Ghosts and Eastward to Tartary, relives an austere, haunting journey he took as a youth through the off-season Mediterranean. The awnings are rolled up and the other tourists are gone, so the damp, cold weather takes him back to the 1950s and earlier–a golden, intensely personal age of tourism. Decades ago, Kaplan voyaged from North Africa to Italy, Yugoslavia, and Greece, luxuriating in the radical freedom of youth, unaccountable to time because there was always time to make up for a mistake. He recalls that journey in this Persian miniature of a book, less to look inward into his own past than to look outward in order to dissect the process of learning through travel, in which a succession of new landscapes can lead to books and artwork never before encountered. Why Read: As anyone who knows me well knows, I’m a huge Robert Kaplan and Travel Book fan. I had been searching for Mediterranean Winter for a very long time. It never appealed to me in Kindle format (much as I love the convenience of ereading). So luckily, I found it in Marco Polo Library (whew). Review: It’s hard to put into words exactly how much I loved this book. I generally love travelogues, so it was no surprise to me as my heart began to pound upon reading the first chapter. The Mediterranean Ocean is a historical powerhouse that brought clashes among the different empires that ruled in their heyday, the Romans, Syracusen, and the Spartans. And Kaplan does that ‘thing’ that he does best. Combining history, personal reflection and travel. That is what he does. Throughout the book, I found myself continuously surprised of really how much I loved this piece of history, and really how little I knew of it. American history classes and World history don’t place high premiums on ancient history anymore. The major civilizations and those moments in history, like the rise of Christianity, the Athenian Fall from Grace, and the smaller changes that develop into world-changing ideas – they all make an appearance. Kaplan seems to have some sort of magical prowess, that I’m caught spellbound and navigated so smoothly through the decades and centuries of the Peloponnese History without any effort on my part at all. The satisfying combination of traveling in the 70s vs. the globalized hegemony of today also makes an appearance, and it couldn’t be better placed. If you are a history buff, travel buff or really are looking for something different – I would recommend this book to anyone. It has a bit of everything: reflection on today’s world, history of the past and the evolution travel. There’s no author I love more, and there’s no book I’m happier to give a 5/5 Stars to. Review Coming Soon: Book Promo: Double Happiness by Tony Brasunas!